Oban Camanachd manager Stephen Sloss has explained why he decided to continue with Daniel Cameron as Oban Camanachd team captain for this coming season. This is Cameron’s second successive season as skipper after leading the side to Scottish Sea Farms Glasgow Celtic Society Cup success last year. 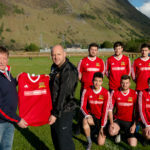 Oban Camanachd manager Stephen Sloss knows he has some tough decisions to make as he prepares his squad for the new season. When asked about the competition for the goalkeeping position, with both Cameron Sutherland and Gavin Stobbart in contention, Sloss said: ‘I’m very lucky to have two terrific goalkeepers. ‘It’s great to have that choice and I would be happy with either one of them to be honest but it’s a choice I’ll need to make. The club have released more details regarding their pre-season friendlies. Sloss and his first team squad are joined by Brian MacCallum’s Lochside Rovers in a training session at Ganavan on Saturday February 2. The following Saturday, the meeting between the Oban Camanachd and Glasgow Mid Argyll first teams takes place at Mossfield whilst Lochside Rovers take on the GMA seconds at Ganavan. Both matches throw up at 1pm. On Saturday February 16, Oban Camanachd travel to face Ballachulish at the Jubilee Park. Lochside Rovers host the Kilmallie seconds at Mossfield that same day with a 1.30pm start. The final pre-season friendlies take place on Saturday February 23. Oban Camanachd are on the road again as they take on Newtonmore at the Eilan. Meantime Lochside are also in action with Ballachulish this time visiting Mossfield. New Taynuilt manager James McLaren is pushing his side for a higher placed finish in Marine Harvest South Division 1 this coming term. Taynuilt finished last season in seventh place; only a point behind sixth placed Ballachulish. They started the year with a win over the Inveraray seconds before earning a draw at Tayforth. Their only other league victories in what was a competitive division came against Col Glen and Ballachulish. They also drew with 2017 champions Lochside Rovers which was arguably their best result of the season. James McLaren takes over as Taynuilt boss from Davie Thomson and Gerry Kilmurray who took the side in 2018. The duo stepped in to replace Neil Gillies who took on the role in 2016 and 2017 but had to step down at the beginning of last year. Davie Thomson previously managed the side from 2007 to 2015. James McLaren’s early shinty memories are playing for Glenorchy at Mart Park in Dalmally. He went on to skipper the side, without losing a game, to the Marine Harvest South Division 1 title as the side flirted with top flight shinty. Glenorchy were also twice runners-up in the Glasgow Celtic Society Cup final during his time with them, losing out to Inveraray both times. McLaren also acknowledges that the club requires a number of important people behind the scenes to survive. Taynuilt play Oban Celtic for the Robert Wylie Memorial Trophy at the Taynuilt Sports Field on Saturday February 9. Badenoch won the Johnstone Rose Bowl at the Nevis Centre, Fort William on Saturday 26 January. There was the usual full house for this popular annual indoor tournament run by Glengarry Ladies. The teams were split into two sections. Lochaber came top of their group, which included Fort William, finishing ahead of holders Skye Camanachd, who qualified for the semi-finals in second position. Badenoch won the other section, which also included Ardnamurchan and Aberdour, scoring an impressive 29 goals without reply in the process. Glengarry came second. In a repeat of last year’s final, Badenoch defeated Skye Camanachd 3-2 in their semi to reach the final where they faced Glengarry who edged out Lochaber in their last four tie. Badenoch, who last won the competition in 2017, beat Glengarry 5-2 in the final with their play-maker Kirsty Deans scoring a hat-trick and Rona Stewart and Megan Ralph getting the others. Kirsty Deans rounded off a good day for Badenoch when she was named player of the tournament. The Johnstone Rose Bowl was donated to the Glengarry Girls’ Shinty Club in 1998 (a year after the team was formed) by Mrs Ailsa Johnstone of DA Johnstone & Son Contractors, Invergarry, which has been a loyal sponsor ever since. Marine Harvest Premiership side Kilmallie have firmed up their pre-season schedule with the new shinty season just over four weeks away. The club recently held their AGM at Caol Community Centre with Alastair MacIntyre continuing as club chairman and Linda Campbell as secretary. The club also noted their gratitude at receiving a donation of £850 from the proceeds of a retiring collection at the funeral of Lynsey MacPherson, wife of Kilmallie stalwart Mark MacPherson. The club recorded Lynsey’s contribution to Kilmallie and again offered their sympathies to the family. The Lochaber Artistic Roller Skating Club received the same amount from the collection. On the field, the Kilmallie first and second teams have been training twice a week at Lochaber High School. New first team manager John Stewart, assisted this season by Mark MacPherson, trainer Ryan Stewart and First Aider John Wallace, starts his term in charge against Inverness at the Bught Park on Saturday February 9. Throw-up is at 1pm. Kilmallie then travel to Braeview Park to face Beauly on Saturday February 16. Throw up is at noon. Kilmallie’s final pre-season friendly match takes place on Saturday February 23 and it’s a cracker as Fort William visit the Canal Park to contest the BSW cup. Throw-up is at 1pm for that one. Kevin Toye carries on as Kilmallie second team manager and his side take on Ballachulish at the Jubilee Park on Saturday February 2 with a 1pm throw up. The Kilmallie seconds also play Lochside Rovers in Oban on Saturday February 16. Ballachulish are pushing ahead with their plans for the new season. Balla’, managed by Morgan Smith and Alan Clark this term, were given a boost when former Lochaber player Jack Dignan joined the side. Dignan has previously represented Scotland at U17 level. The Marine Harvest South Division 1 side play the Kilmallie reserves at the Jubilee Park on Saturday February 2 with a 1pm throw-up. Balla’ take on the Fort William reserves the following week before being tested in an Oban double-header, first at home to Oban Camanachd and then away to Lochside Rovers a week later. Glenorchy began their pre-season training in the Dalmally Community Centre at 7.30pm on Wednesday January 30. Glenorchy, who finished third in Marine Harvest South Division 2 at the end of last season, say new players are welcome to attend. Caberfeidh manager Jodi Gorski has put together a challenging pre-season for his side. Caberfeidh host Lovat at Castle Leod on Saturday February 2. Newtonmore are the visitors a week later and Kingussie complete a Badenoch double-header on Saturday February 16 as the sides compete for the William MacPherson Memorial Plate. Kingussie are the holders having beaten Cabers on penalties last year. The Caberfeidh second team have arranged friendlies against Strathspey Camanachd on Saturday February 2 and against the Kingussie seconds a fortnight later. The Cabers reserves then take on their Lovat counter-parts at Balgate on Saturday February 23 as part of Lovat’s celebrations as they officially open their new clubhouse. Cabers have also carried out repairs to their goalmouths at Castle Leod whilst also purchasing a defibrillator for installation at Castle Leod in association with the Lucky2BHere charity. The club hope to train all players and committee members in the use and associated CPR, of the defibrillator. Caberfeidh would also welcome any donations towards the cost of the defibrillator. Marine Harvest National Division side Strathglass have arranged three pre-season friendly matches for the month of February. Strathglass welcome Lochaber to Cannich on Saturday February 9 to contest the Murdo MacKenzie Memorial Cup. ’Glass then head for Craigard to face Glengarry on Saturday February 16 . There follows a double header at Cannich on Saturday February 23 as the Strathglass and Glenurquhart first teams meet with the MacDonald Cup at stake whilst the club’s reserve sides contest the Ali Ban Cup. Murdo John Fraser will stay on as manager at Lochcarron for next season following the club’s annual general meeting. Gregor Cushnie and Kenny Cushnie are expected to return to the Lochcarron squad for their Marine Harvest North Division 2 campaign after a spell with Aberdeen University. However, key player Michael MacMillan is unlikely to be available. Ardnamurchan will field a side in Marine Harvest South Division 2 next season, returning to league shinty after a seven-year absence. They will join 2018 champions Strachur who have opted not to step up to South 1. However, the GMA seconds have been promoted in their place. There will be nine teams in the Marine Harvest National Division following Bute’s promotion. 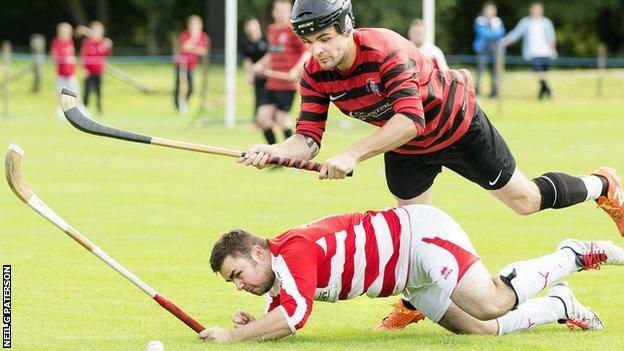 Inverness, who finished bottom last year, will continue to play national shinty. Aberdeen University ended last year bottom of Marine Harvest North Division 1 but they have successfully made the case to remain in the division where they will be joined by newly promoted Lovat reserves. Glasgow Mid Argyll were 2-1 winners against Aberdour in their pre-season friendly meeting at Yoker. Former Kinlochshiel player Oliver MacRae made his first start for GMA whilst Nathan Whear, who played for the ’Shiel seconds last season, and former Lochcarron player Matthew Young, also featured for the Glasgow side. David MacKenzie gave Aberdour the lead but GMA levelled soon after when ’Dour keeper Tom Bowerman saved from Calum McLay but Oliver MacRae forced home the rebound to make it 1-1 at the break. Aberdour goalie Tom Bowerman made a number of good saves in the game but GMA’s Iain Luke scored from another rebound in the second half to give new GMA boss Mark Bain a winning start. The pre-season friendlies begin in earnest on Saturday February 2. Oban Celtic make their first appearance of the season as Glengarry visit Mossfield. This will be a first game in charge for new Oban Celtic boss Dougie MacIntyre and the match throws up at 1pm. There is an all-Premiership meeting at Castle Leod where Caberfeidh and Lovat clash in what should be a testing match for both teams. Kinlochshiel were to host Inverness but the match has been switched to the Bught Park, Inverness with a 12.30pm throw up. Ballachulish take on the Kilmallie second team at the Jubilee Park with a 1pm start. Boleskine have home advantage against Aberdeen University as do Badenoch & Strathspey against the Caberfeidh seconds. The Glenurquhart second team take on the Inverness second team. Skye A and Skye B meet for the Ewen Morrison Memorial Cup at Pairc nan Laoch, Portree. Throw-up is at 1pm. The Women’s Camanachd Association has issued its fixture list for the 2019 shinty season. The Marine Harvest National Division programme gets off to a stunning start on Saturday February 23 as Skye Camanachd and Badenoch, who contested the title race until the final day of last season, meet at Pairc nan Laoch, Portree. Newly promoted Glenurquhart host Ardnamurchan, promoted at the start of the 2018 shinty season, the same day. The following day, Lochaber journey south to Silversands to face Aberdour whilst Glasgow Mid Argyll have home advantage against Strathspey. The regional league fixtures commence a week later. There is a derby meeting in Marine Harvest North Division 2 between Glengarry and Fort William at Craigard whilst Lochaber travel to play Strathglass. There is another derby as the Skye Camanachd second team and Kinlochshiel clash at Pairc nan Loach, Portree whilst Inverness have home advantage against Lovat. The Marine Harvest South Division 2 opening fixtures that same day see Oban Lorn host Cowal and Bute whilst Ardnamurchan journey to take on Tayforth. Uddingston host the first round of Central League development fixtures.